This post has been a long time coming; but instead of expounding too much about it, I'll let the finished space speak for itself. Our den is finally "complete"--whatever that means. Elements in the room will definitely change over time but, for this moment in time, it feels very 'us'. Take the full tour and be sure to share your thoughts! I'd really love to hear them. So far, the best compliment we've received on the den came from our awesome carpenter, Rich. He called the room "right out of 'Town and Country' magazine". Little did he know that his words have made me chomping at the bit to share our den with you. Tomorrow, be sure to come back for full details and sources for the items in the den! What do you think? Worth the wait? 100% worth the weight. You did a spot on job my friend - this room is magnificent! The color and texture mix are perfect and you are so good with details. Love it!!!! Absolutely fantastic!! Love that you kept the knotty pine and made it Town & Country, like Rich said. The furnishings are great and I love all the texture you brought in. Your carpenter was right! I love the dramatic blue and the fact that you even painted the doors! Love the color! Our bedroom is navy with navy curtains and it feels so cozy. Great job!! Such a great space. Love how you balanced the enveloping dark with natural elements and wood tones. Love it! It looks fantastic! Love every detail! Turned out fabulous!!! Has a rich almost Ralph feel with a relaxed touch, I LOVE it!!! So lovely! I adore the couch, the mirror, your pillows, all the touches of natural wood - just stunning. You've inspired me to keep moving on my own projects! Ashley! It is so moody cozy perfect. I love the same tones for walls and fabric--like a cocoon. And that pine dresser is the best. We need more pine in our lives. Excellent work! I love this room! and everything in it. Great job and great taste! AShley its been so fun to watch your style evolve over the last few years. You are den is so cozy and rich and has so many lovely details. Fantastic job!!! Elegant and cozy at the same time. Great attention to detail! Y'all did a great job! Oh, Ashely, it is beautiful!! Town & Country, House Beautiful - it would look right at home in any shelter mag. Love the dark, moody walls with light upholstery. Just the right mix of masculine and feminine and all you!! I love that you streamlined the doors right in. great idea. Congratulations on this very beautiful and enveloping room! I'd love to withdraw to your den after a hearty meal.....have a glass of vintage port in front of a roaring fire. Fabulous, Ashley!! High fives! It's beautiful. I see a Miles Redd and Tom Scheerer influence through - Miles for the dark, moody color on the walls and Tom for the classic yet current pieces throughout. I'd love to see another photo of your window and window treatments - it looks like you get great natural light in this room. I'd also love to know if you grappled at all about the TV over the fireplace because I'm going back and forth with that decision right now. Great great work - I bet you're enjoying this room a lot. Is this your main hangout room when you guys are at home? Great job! I have to say, I'm excited to hear about all those lamps...! This is gorgeous Ashley! Great job! I love the colors. Fantastic!! It looks gorgeous, nice work! Fabulous! What took my breath away was the woven peacock cushion. I was looking for 'peacock' on e-bay and just this minute I click on your link to come across the perfect cushion. Very nicely put together. Looks fabulous...love the dark blue walls. Whoa! I'm almost speechless! The color on your walls is LUSCIOUS! And how you balanced that with all of your lighter fabrics and the gorgeous pine dresser? Yum! I love how your TV disappears. I love the ticking stripe on your ottoman. I love that urn filled with greenery. I love the way your drapes blend into the wall. Just a beautiful job here, Ashley. You're a talent! Lordy is pretty. did you consider painting the ceiling? Just wondering. Oh my! Absolutely gorgeous. I'm dying over the wall color and painting the trim the same color was brilliant. Fantastic work. Hi Ashley! Just now seeing this - Wow! Your den is wonderful! Congratulations! You've got talent, girl! It's been so wonderful to watch your style evolve through your blog over the past couple of years! Thanks for sharing. Your home is gorgeous. What a beautiful job. Rich, the carpenter is working this week at my home and doing a wonderful job. He is a meticulous worker. It's delicious. I love those rich walls and rope mirror the most. This is beautiful! Want your sofa! Holy crap that blue is great! Love the linen roll arm sofa as well. Ashley, I loooooove love love your den! 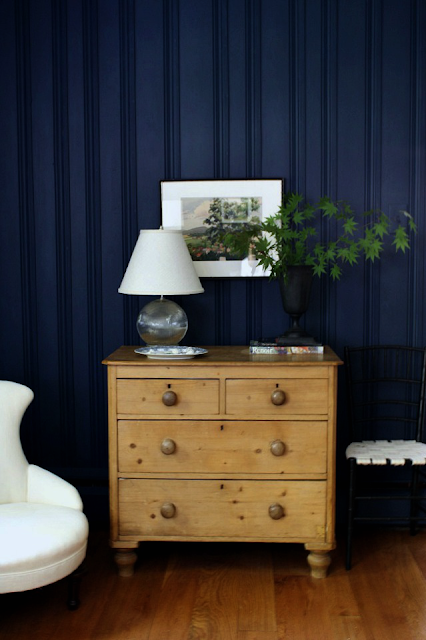 The navy walls, linen and white…..all so delicious! I'm so glad E at LBD introduced to me your blog, I look forward to poking around over here! Ashley my mouth dropped open when I saw the blue. This is great! I need that sofa, it looks delicious. Will you post sources? My sister shared your blog w me and I'm soooo glad she did!! The den is perfection!! Hope you enjoy every hard earned moment in it!! Revealing My Den on Monday!